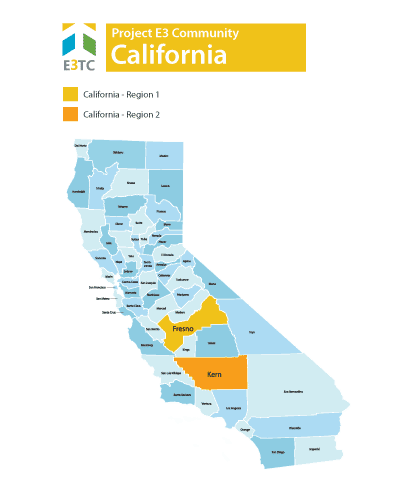 California is a location chosen as a targeted community through the Vocational Rehabilitation Technical Assistance Center: Targeted Communities (VR-TAC-TC) or Project E3. Project E3 will partner with State VR Agencies and local community partners to improve outreach and employment-related services to underserved people with disabilities in this community. California is the most populous state in the United States. It is regarded as a global trendsetter in both popular culture and politics, and is the origin of the film industry, the hippie counterculture, and the Internet and personal computer. Fifty-eight percent of the state’s economy is centered on finance, government, real estate services, technology, and professional, scientific, and technical business services. It has the 6th largest economy in the world and one of the highest disability rates in the nation. Agriculture is the primary industry in California’s Central Valley. Primary sources of population growth in this region are people migrating from the San Francisco Bay Area seeking lower housing costs, as well as immigration from Asia, Central America, Mexico, Ukraine and the rest of the former Soviet Union. California has the highest cost of living in the United States apart from Hawaii. The high Fresno poverty rate represents very widespread deprivation. Research suggests that both of the targeted populations are at increased risk for experiencing trauma. The effects of trauma can reduce participation in employment-related activities and affect vocational rehabilitation service outcomes. Benefits Counseling: Provide information on Social Security program rules and how employment impacts benefits. The goal is to help people make informed choices about employment. Career Exploration Group: Discuss employer expectations, learn job and social skills, and explore postsecondary education programs. The goal is to increase participants’ ability to explore and access careers. The group will ultimately be peer-led. Employability Skills Training: Employability skills training increases a person’s ability to work with others and function socially. It also teaches how to adjust to workplace expectations, including written and unwritten rules and social norms. Financial Literacy Training: Support people to develop skills and knowledge about personal money management and help them develop a plan for their financial future. English as a Second Language Training: Connect non-native speakers with language learning opportunities in the community. Project E3 will provide California’s state Vocational Rehabilitation agencies and their partners with the skills and competencies needed to effectively and efficiently address barriers to competitive integrated employment and community integration encountered by persons with disabilities in these regions. We will leverage promising practices, knowledge, and experience gained from this project to expand employment opportunities for individuals with disabilities from underserved and economically disadvantaged populations throughout California and across the United States. Within 3 years, attain the same rate of vocational rehabilitation applications and successful employment for 18- to 30- year-old Hispanic and Asian applicants as the state-wide average.